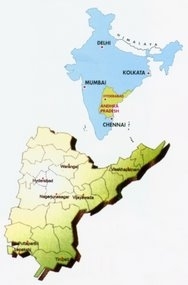 The South Indian state of Andhra Pradesh spans the greater part of the Deccan plateau. It has witnessed many civilizations from 300 BC onwards: from the Maurias and many more dynasties through the Quth Shahis and the Mughals to Dutch, French and British rulers, each having left an indelible mark on this land. A perfect bland of history and modernity, wildlife, heritage, leisure, royalty, temples and palaces, beautiful arts and crafts, rich markets of silk, pearls and diamonds, Andhra Pradesh is an attraction for visitors from all over the world. Besides the capital city Hyderabad, many of the other towns are also chosen for a destination of their tours: Tirupati and Tirumala – for their exquisite South Indian Hindu temples; Amarvati – as a renowned Buddhist centre of learning; Warangal, once the capital of Kakatyas – for the ruins, speaking of its past glory; Vijayawada – for its rich heritage, preserved in cave temples. Andhra Pradesh has a long coastline famous with its ports with centuries old trade, beautiful rock formations and beaches.